The Romans are on the verge of defeating Carthage and ending the First Punic War. Regulus and a veteran Roman army have landed in Africa, and though woefully short of cavalry, have defeated several Carthaginian forces. Desperate, the Carthaginians turned to an otherwise unemployed Greek general, Xanthippus. While not on a par with Alexander the Great, Xanthippus at least knew how to train and command an army, and that was enough. The Carthaginian army marched into the Bagradas Valley, and Regulus, confident of yet another victory, offered battle. It was to prove a costly mistake for him. The Carthaginian cavalry and elephants routed the Roman cavalry, and then turned on the flanks and rear of the Roman army, now fully engaged with the Carthaginian infantry. The Roman army disintegrated. Those who survived told of the horror of being overrun by elephants and cavalry. This Carthaginian victory prolonged the war. It took several years before any Roman army would stand and fight against elephants. The larger lesson— proper employment of a combined arms army over a largely infantry army resulting in victory—was lost on the Romans. They had to re-learn it at the Trebbia, Lake Trasimenus and Cannae. All in all, a very entertaining brawl full of twists and turns. It was Andreas' first shot at C&C: Ancients (hence the name of the battle) and it was a very fine outing for a newbie. I think it is a very well balanced scenario full of possibilities and multiple approaches. Romans formed a forward line by centering their LI two hexes in front of the MI...and there they managed to stay, until almost the end. 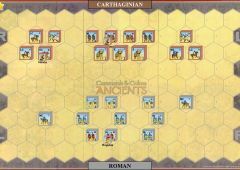 Carthaginians advanced their own LI straight ahead, leaving a central gap for the Elephants to charge straight through. Romans anchored their LI line with Auxilia. Carthaginians advanced Elephants down the central corridor, and Warriors on the right. 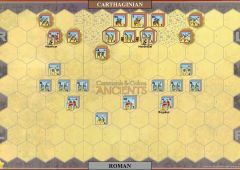 Things then got bogged down for the Carthaginians, who were restricted for too long to flank advances. The Romans found that although Elephants are large (and, here, immobile), they are surprisingly hard to hit with javelins :-/ However, the hits added up, and eventual Rampages ended up with far too many brown-on-brown Elephant casualties. 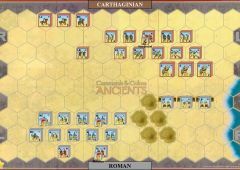 Xanthippus and the Carthaginian HI waited, camped at the rear, for the carnage to finish. Meanwhile, on the Carthaginian right, Warriors (supported by cavalry and LI) started making a mess of the Roman Auxilia and LI. A detachment of Roman MI and HI tried to make a difference, but a well-timed First Strike saw the Roman HI sent reeling back in tatters. Things were looking equally bad for the Romans on the Carthaginian left, where Hamilcar had brought his Light and Medium cavalry detachment forward to make a mess of the Roman Auxilia and LI on *that* flank too. Sensing disaster, Regulus had a moment of inspired leadership, sending his own cavalry swinging around to Hamilcar's rear, to be the anvil to Regulus' MI hammer. While the Roman cavalry took terrible casualties, the combination of missile fire from the flanks, relentless infantry at the front, and a blocked retreat path, saw the dissolution of Hamilcar's detachment. The Carthaginian HI came to life just in time to see Regulus's unit chase Hamilcar off the field. Despite Hasdrubal's exhortations that the Roman left was about to collapse, Xanthippus wasn't so sure, and the Carthaginian forces decided that enough was enough, ceding the field to the Romans. This one does look a cert for the Carthaginians. A better army, more cards, more leaders and they go first, but my solitaire scores of 2-2 didn't bare this out. 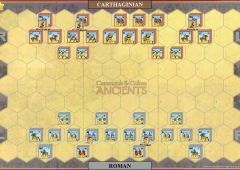 I was confident however, through these plays, that the best Carthaginian strategy lay in a steady cautious approach. Get the elephants out the way, gather the strong heavy and warrior infantry together and launch the assault. when the Romans are faultering the cavalry and elephants are there to finish the job. Simple, or so I thought. Face to face play, and horrendous dice rolling, have a habit of blowing the best laid plans out the water. I played my brother this summer with him as the Romans. My starting cards were mostly flank and mounted cards, but rather than be patient I launched my cavalry and elephants forward in total divergance with my plan. What was I thinking! The elephants were initially successful in taking out a whole unit of mediums to a mounted charge, but everything else went absoloutly t*ts up from there in. In one assault by a medium and 2 Light cavalry units all with leader benefit (10 rolls), against a light infanty unit with no leader support and no evade path, I inficted 2 casualties whilst losing 2 mediums (double triangle), leader (double leader), 2 lights (double circles) and a whole light cavalry unit (double retreat). This ridiculous luck continued, not in such an exteme vein, for the rest of this short game and I lost 7-2. A victory for the Romans, but a close run thing. The Carthaginian cavalry and light infantry on both flanks tried to punch out the Roman cavalry but failed, taking a serious beating on the left flank in the process. 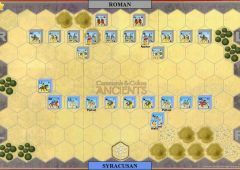 The Roman center advanced, forcing the elephants to attack unweakened infantry in order to avoid being forced to rampage and retreat through their own troops. They did some damage before being annihilated, but not what they should have. 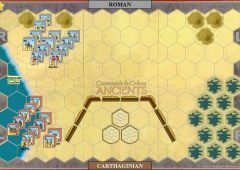 After that it turned into a slugfest in the middle, led by a Carthaginian barbarian charge, that succeeded in bringing the Carthaginians up to five victory flags before the Romans finally took the field. A Roman victory, but a Pyrrhic one - it's doubtful Regulus would have been able to follow through against Carthage after the hammering his army took (consisting almost entirely of light units at the end, while Rome held the field the Carthaginian army actually came out in better shape), and if the Romans failed to learn the needed lessons from a defeat, they're even less likely to learn them from a victory. Still, a win is a win. This account of the battle of Bagradas (253BC) has recently come to light and believe to have been penned by one of the “lost” historians of the era and a contemporary of the great Polybius, Titus Marius Arcangeli. In the tradition of ancient writers these account appears to have been written some time after the battle so some of the minor details of the battle seem to have been lost. Carthage really had the upper hand on this one when it came to orders. They managed to get two mounted charges, two I am Spartacus, and several outflanks. 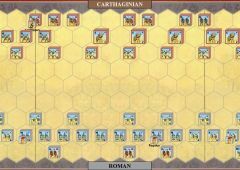 This heavily impacted their strategy which was to push their wings forward and attack the edge of the Roman line, avoiding the heavier units in the center. The light cavalry darted in to cut off retreat routes while the heavier mounted units would crush them. Amazingly, all of casualties were caused by the light and medium cavalry, not the three elephant units. Poor Rome had no luck, only able to use its weaker flank units to strike back at the cavalry. They had several advance center cards, but it was difficult to maneuver them around the light units in the front. The Carthaginians took the adage \&quot;No Guts, No Glory\&quot; to heart for this battle. 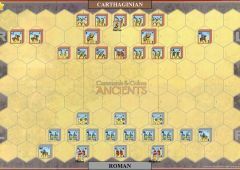 After a first turn positioning move of moving up for harassing fire, Carthage decided to make sure the elephants played a part in this battle. With several orders to ensure that they would wreak havoc in the field, the generals pushed the animals forward. Unfortunately somebody forgot to tell them they were supposed to actually injure those they were battling. The elephants managed to cause three blocks of casualties before being eliminated. Even less impressive when you consider that only one of those was from the enemy. The rest of the battle consisted of conflict between the two armies' flanks. Besides the elephants, all of the casualties were from the wing units. 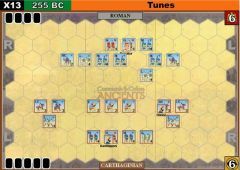 The battle looked firmly out of Carthage's hands, but through some sly positioning and some luck they managed to swing it almost their way. Carthaginians with 6 cards and 3 elephants against pre-Marian Romans with just 4 sounds like a slaughter in the making, and that's how it was historically. It is actually possible for the Romans to win this one (I did it), but it requires aggressive use of light infantry against the elephants and a hard focus on taking out the Carthaginian cavalry before the lines close. This is the third scenario included in base game.